writerwriterwriter: Writing Progress, all current projects. Writing Progress, all current projects. Just made the *best* connection in the book. One of those things that drops into place like it has been machined into 1/1000th centimeter tolerance and fits! Oh I love my job. I was awake between 3:00 and 5:30 whispering into my digicorder and walking the dark house back to front...staring at the moon through the trees. The book is getting deeper and wider. Maybe getting what Richard has, coughing a little ...gave up on sleep at 4:30, have been working since. I'm writing Sadima's story but have to switch soon. Hahp's story interlocks; I must make them fit. The timelines--200 years apart in the first book-- are now within 40 years of concurrent. Sadima is fighting to stay whole: The boys are capable of anything at this point. Anything. So who knows? Not me. I love my job. Here for two minutes, apologies to the people I am not responding to for real-time chat... I have to seriously WRITE now...in a few months will have a little more time to play...NEW WEBsite coming soon...YAY!! The nameless book three is flying. Which is good. Because it took a long time to START flying. But, of all things, there appears to be a love story emerging. Maybe. I can't quite tell yet. A really really REALLY weird one. Just wrote a really good chapter. Let the twists begin!!! Today (In the unnamed book I am being eaten by) two people will be face to face who have not seen each other in 10 years. I am afraid that one will not be honest about where and why and what and who...and that the other one won't see the lies because of fear and exhaustion. Not just yet, anyway. I apologize for the whining. I am a little stressed, I think. Giant dreadlines are far to close....So I am off to write. The weird love story is looking more likely. I just...? It really is odd...but kind of wonderful, too. Woke up with a little avalanche of revelations about something in Limori that has puzzled me lately. As you may know, there were no libraries in that mostly illiterate city except the royal one, which should have fallen into the hands of the magistrates when the last king was dethroned. But it didn't, and now I know where all those books are. Of course. Sadima has not been to South End in years. This morning, she is on the long road from the countryside into the city of Limori. She has two graves to visit, rent money to collect, a cypress tree to find and a man she must deal with. One way or another. What happens in South End...stays in South End? Not this time. Sadima visited the graves and went to the meeting hall, where Thomas spoke so often. It's locked up; a broken window; a man in a red tunic seemed to have the keys. But about an hour later, in the middle of a cobblestone street, near what was once her cheese shop, something happened to Sadima that has changed everything. Two stories, 200 years apart. The first story causes the second, and by the middle of this last book of the trilogy, the time gap will have closed. The stories are about 30 years apart now. I often write 5-10 chapters of one strand, then switch. Sadima's story is at a resting point, so I will go back to Hahp and Gerrard now. Somiss seems to be gone. Why? Is it a chance or a trap...I will begin to find out today. I ended up following Sadima through a very long and very hard night. And now, TODAY, it's back into the maze of passages inside the cliffs...I am hoping the boys are alive, eating, reclaiming their humanity after what happened in Sacred Scars. There are only five of them alive now. Hahp, Gerrard, Will, Levin and Jordan. Report from inside the cliffs: everyone is still alive and managing, but the simple logic of "pass or starve" is disintegrating. I have no idea why or what will be replacing it, if anything. I can't tell where Somiss is, but Hahp thinks something is wrong...so do I.
I am stopped cold this morning by a new idea. Will jot the thing down until the ideas dry up, then sprint back to Limori. The sad scene got written. Oh I cried. Then I had to do writerly nonwriting things (2 interviews, respond to emails, books flights for Jan FL writers intensive, etc, etc, ETC. and answer an email from an artist friend who is doing stage design for a play in China. Then I cut down more tree limbs. Today! Now! I write the long awaited scene of the beginners' exercises for the magic that underlies all other magic. Sadima demanded my attention late last night. And when I add a chapter for her, I have to re-pace the Academy side of the story to add one there, too. Got up early and JUST finished the reordering. NOW I can reread the long awaited Franklin's New Class scene written yesterday morning. It came out faster than I could type, always a wonderful feeling. Next up: a midnight meeting. I think. Ok. I have to split my time for a week in order to finish the third title of the Faeries Promise. So....Mornings= Faeries's Promise for 2-4th graders. The dark of night will be for the Limori Academy...As of last night I can only say that the forgotten half caved-in passages of the ancient smugglers' tunnels beneath the city of Limori are attracting street orphan "squatters" as the weather turns. The Faeries Promise: faeries are forbidden contact with humans. Old Lord Dunraven made the laws. Without magic, people are dulled, easier to rule, better serfs. Alida was the hostage to ensure her family's exile, but Gavin, a human boy, has helped her escape. It's an apartheid story, in a way, both cultures damaged in isolation. In Limori: it's all about trust. And shame. And secrecy. And juggling. The book with no name: It is raining in Limori today. Sadima is painting, crying. The street-rat kids are shivering and hungry. Inside the cliffs, no one can hear or even smell the rain. But they can hear screams. This one is lurking at the edge of my thoughts most of the time. HUGE idea file now, many-many digicorder notes. Can't wait to write it. The treatment is growing, expanding and the story is getting grittier and wilder. I will send it off to the incredibly patient agent (we talked about this at lunch in NYC in 2007) soon. I have one included in an upcoming anthology edited by Holly Black and Justine Larbalestier. It's dark...about a unicorn who has lived too long. Many incredible writers are included. (((The amazing editors: Holly's upcoming THE WHITE CAT is intricate, mysterious, creepy, set in a world almost like ours...*almost*. It stars a teen you can only love and worry about… first of a trilogy. I am writing short stories set in Limori, the city of A RESURRECTION OF MAGIC for my website which is slowly being completely rehauled. It’s a mess right now. It will be awesome…And when the stories are up, I will announce it here. Still splitting days. Faeries are on their way back to Ash Grove: Elders, adults, rambunctious faerie kids, babies, goats pulling stout wooden carts, a caravan of winged people--all walking. Midday, continued reading. From 5pm to eyes-are-closing-time, back to Limori. Sadima knows she is being manipulated but by whom? And why? In a meadow near Ash Grove, everything grows faster because the soil has absorbed magic for a thousand years. The townspeople suspect the faeries have come home. They are all so afraid of what will happen when Lord Dunraven finds out. Am trying to find a middle grade novel idea I can fall in love with to send an editor I REALLY want to work with. Can't find one yet. Keep coming up with great ready for chapters ideas instead. Also fiddling with three other things, sort of a holiday break and idea-fishing trip... Have to get back to REAL work soon. But wheeeee....this is nice. 11/28 Copyedit/final go-through on Silence and Stone today. Should get the copyedits of (book #2) Following Magic back next week. Wishes and Wings (book #3) is off to the editor. I will start writing the fourth one mid next week. Good day yesterday: finished Silence and Stone copyedits (short book, 60 pages), wrote text and batched pictures for the website re-do, gave the Free Rat proposal a couple of hours, and recorded MANY ideas/insights for the third Resurrection of Magic trilogy book while doing yardwork. Today: First, the dried out, now lettuce-edged Following Magic copyedit. Tonight: Free Rat again, I think. Or back to Limori... ((added 12/1 : thanks to the people on FB and Twitter who voted for Limori. You won. Hahp and Gerrard are learning this a quickness of mind and body that astound me. And them. I am not sure where yesterday went. But it is gone. This morning I have begun a final read thru of the Faeries Promise #2 copyedits. Noonish, I will begin the revision of #3, which UPS says is *almost* here... THEN, tonight, I intend to go visit Russet. Thanks to everyone who is nudging (and the few who are pummeling me) me to get back to it. Please don't apologize for working frantically on book 3! I can't wait to read it! 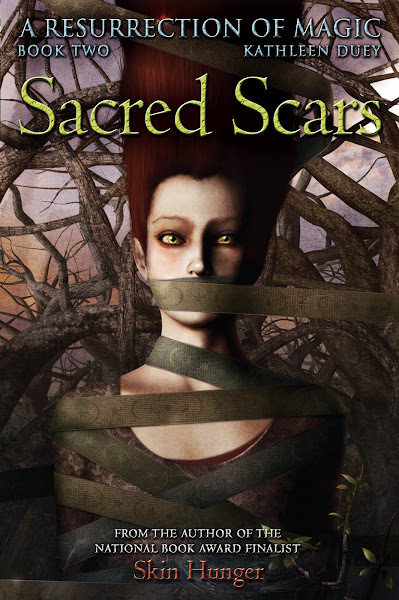 Sacred Scars was wonderful. I lost sleep for about a week reading it while my family slept. You are a true master storyteller, and I am in awe of your accomplishment with the first two books. I really enjoyed this post because it reminds me so much of what it feels like when you love to write. I took a slightly different path in life - but am coming around now. I have been a technical writer for more than 15 years, often burying my need to write my own thoughts and imaginings...or releasing them in brief articles. I wrote my first book many years ago and did nothing with it. My second is now in the editing stage. It, like my first, are both about to be published...finally. I'm so happy to read how your stories are developing and hope to get copies of your books. Congrats on your books!!! Yay!!! I slept with my first book under my pillow for a week so I could slide my hand underneath and reassure myself that it had finally happened. Thanks for blogging about what you are writing. The first two books in this series I read straight through. I couldn't put them down for anything, because they were so intriguing. These short paragraphs are helping me be more patient waiting for the next book to come out. :) I thought I was going to die waiting for the second book and am feeling the same way waiting for the third. I think you will like the third one. It is going odd places and taking weird turns. So there WILL be a third book for the Resurrection of Magic? Whoops...I suppose the word "trilogy" implies that. Anyways, can't wait! When do you think that the third book of the trilogy will be out in stores? I got my teacher hooked on the first two books and I need to know what happens!!!! This is an awesome trilogy!! I am working on the third one now for Summer 2011 release. Sorry for the wait, these are complicated books! I LOVE that you got your teacher into the trilogy,too. It's a online novel in progress--not finished--that I add to whenever I can. It's been much less lately, but I will get back to it soon. Jade, thank you so much! I am always so happy when people like my work. I don't know where you live, but this place might save you money and time!!!! I cant wait tell your third book comes out, ill be the first to buy it! Emma, thank you! I am just about to start for the day. The third book is beginning to come together--the ending, I mean. I still have **a lot** of writing and then revising to do, but I am starting to understand how it has to end. For me, that's like a light on a foggy night--I know which way to go.